This input allows you to enter, change the Name used for the Set. During Set creation, the App has capability to search your entire collection for Coin's that should be members of this new Set. This saves you the time of having to individually search thru your Collection and manually designating which Coins should be part of this Set. If you'd like this automatic match-up, enable this option. 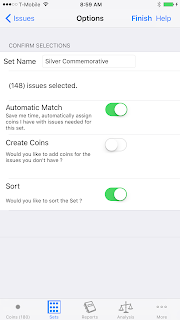 This option will instruct the App to automatically create Coins for your Buy list for any Coin in the Set which you do NOT already have. This will save hours of work. For example, Morgan silver dollars have over 400 distinct coins. If you were to manually add all 400 of these coins, it would likely take 2 days. The App can do that for you in 30 seconds if you enable this option. If you'd like to create a Set covering every issue in a Type, this option and the Automatic Match option, will save literally days of typing. This option is useful when adding / updating a Set. It will cause the App to Sort the Set by natural order (Issue within Type). 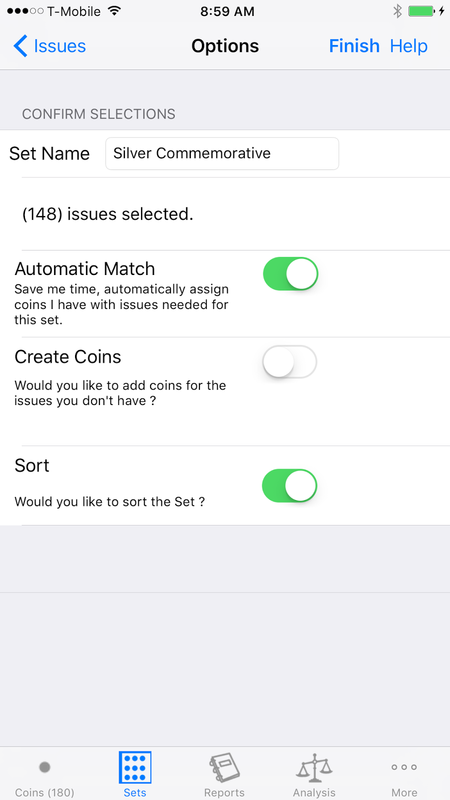 If you don't enable Sort, new coins will be added to the end of the Set.